These are from Pharmacy Times, and it’s actually a pretty mellow list compared to some of the things I’ve heard said at my pharmacy, especially the guy who was upset about his prescription not being filled and came out with “I’m going to go home and get my AK-47 and come back.” Normally that wouldn’t be that concerning except the pharmacy knew that the guy used to be a Navy Seal and could very well have been serious. Police were called and told me there was nothing they could do unless he came back in with the gun in which case I should call them right away. Yeah right, I’ll call you after I’m out the door and at least a block away. We have all been there at some point. 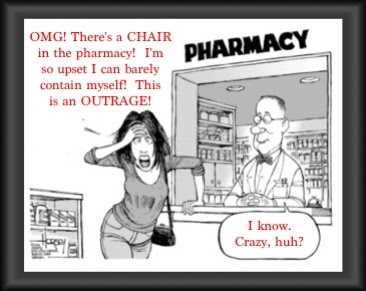 Whether as a tech or an intern, a customer or a supervisor, or a career retail pharmacist, we have all heard some of the crazy things customers say at the pharmacy. Some make you cringe, some just make you roll your eyes, but you know it when you hear it. There are some things you should not say at the pharmacy. I present to you my (slightly) sarcastic take. I have a bigger list, but here are a few. OK, first thing here: no returns on prescriptions are allowed at the pharmacy. Once it has left the pharmacy, unless it is an error on the pharmacy’s part, you own it. We must get this right the first time, which leads me to my second point. If this anything more than a simple pay and pick-up errand, DO NOT leave it in the hands of your husband. Husbands will do anything to make sure they do not have to make a return trip or come home without what you sent them for. I know this because I am a husband. Here is my advice. Ladies, take pictures of what you need and give ultra-specific instructions. Husbands, please listen to said instructions. If you run into a situation where you are asked to make a decision, don’t do it! Step away from the counter so you can call home, and hope she answers (she won’t). If she doesn’t answer, just leave the medicine and go home to ask her the question. You live close by, so it’s okay. Also, if she sends you to get Benadryl, then get Benadryl. Don’t listen to the pharmacist telling you Claritin is better. Get what you were sent for. Can we just pick a name and stick with it, please? It doesn’t seem that difficult to me. Decide what you want your formal name to be and keep it that way. Give that name to your pharmacy and your doctor. Put it on your driver’s license. It is okay if your friends call you something else, but your formal name must always stay the same. If you are a junior, I’m sorry. This isn’t your fault. You will always be forced to check whether you are receiving your medicine, or your dad’s medication. Most retail chains have wholesalers who supply them with their medication. Sometimes the wholesaler will change what manufacturers are sent to the pharmacy, based on pricing or contract changes. It is the same medication, but it might look different. If your pharmacy is able to special order the blue tablets for you (some aren’t) please be thankful, and help them remember what your preference is. There are a lot of customers to serve and it is difficult to remember to do things certain ways for certain customers. Friendly reminders when you re-order are always welcomed in this situation. Folks, please be respectful in any retail setting and don’t rush in at the last minute to do something. The employees are trying to clean up and get ready for the next day so they can leave on time and get home to their families. You have known all day that you needed this and the store has been open all day. Don’t make your lack of planning become their emergency. The only exception here would be if you have been stuck at the acute care clinic or ER for a long time and just got released. Otherwise, it is okay to ask for what you need, but at least offer to come back the next day and pick it up. Really? A good general shopping rule is to pick up your frozen food as the last thing. Go to the pharmacy first, make your request, shop for whatever you need, and then hit the frozen food on your way out. Don’t sit down with ice cream in your basket and then ask for a shingles vaccine. Some things take time and your ice cream is not the priority. If you do run into a situation where your ice cream is actually melting, you can simply walk back to the freezer and swap it out for another one. I know that’s asking a lot, but you can do it. Sometimes it is fun to look at the lighter side of things that can get on your nerves. Truthfully, customers should find their pharmacy to be a place where they can get the best customer service anywhere. Hopefully they will avoid saying these 5 things and make their trip even more enjoyable for everyone!